The Fall 2012 issue of Global Health Governance will examine the application of human security principles in the global health field. Building on two seminal reports on human security—the 1994 UNDP Human Development Report and the 2003 report of the Commission on Human Security (CHS), Human Security Now—the issue will explore both the contributions and the limitations of a human security approach in the global health field, particularly in an era of economic austerity and increasingly harsh natural environments. The concept of human security originally grew out of the realization that national security—the protection of territorial borders by state actors—is not sufficient to protect people from the most critical and pervasive threats that they face in their daily lives. By emphasizing the root causes of vulnerability at the individual and community level, human security is meant to complement, not replace, national security. While there is still some debate about exactly what human security is, the most widely cited definition is that of the CHS: “to protect the vital core of all human lives in ways that enhance human freedoms and human fulfillment.” At a more practical level, it is often defined as engaging individuals and communities in identifying the root causes of their own vulnerability, recognizing the interrelations among various sources of vulnerability, integrating top-down “protection” with bottom-up “empowerment,” and ultimately building people’s resilience to existing and potential threats. If human security aims to protect the vital core of human lives, it is natural that health would be a key component of human security. So what impact has the introduction of human security—both as a concept and as an approach—had on the major debates in the health field and on how health is delivered? Authors from a wide range of disciplines are encouraged to submit papers that explore the place of human security in the global health field over the past two decades. Has human security played a role in the growing attention and funding that health challenges have garnered or in the ever-shifting emphasis on disease-specific versus health system approaches? Has it changed the way we approach health concerns in a variety of different situations, such as in the wake of natural and man-made disasters or in environments of extreme poverty? Are there elements of human security in the global efforts to prioritize primary healthcare and prevention? How has our understanding of human security evolved since it was introduced on a large scale in 1994? In cases where human security has been adopted, has it had an impact on health outcomes and, if so, in what way? 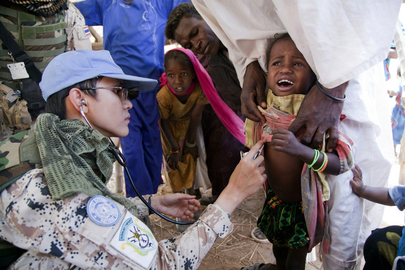 Are there opportunities for human security to play a bigger role in the global health field? Authors are encouraged to consider these and other questions in their submissions. Authors intending to submit a manuscript should submit via email to ghgovernance@gmail.com a proposed title, author names, and an abstract of no more than 250 words by June 15, 2012. Authors invited to contribute a full manuscript will be notified by July 2, and should submit the manuscript for peer review by October 1, 2012. Accepted manuscripts will be published in the special issue in December 2012. The guest editors for this special issue are Jack Chow, Distinguished Service Professor at Carnegie Mellon University, Susan Hubbard, Senior Associate at Japan Center for International Exchange, and Keiko Watanabe, independent consultant. Please contact GHG at ghgovernance@gmail.com with any quesitons or comments.